Is Your Organization Moving Towards a Skills Gap Crisis? , consumer market, business process, it is very important for organizations to have the right skills set among their workforce. The skills gap is widening across many industries and organizations are struggling to find people with right skills set despite the availability of a large pool of candidates. A report by Deloitte Consulting LLP & Manufacturing Institute Skills indicates that “Over the next decade nearly 3 ½ million manufacturing jobs likely need to be filled. The skills gap is expected to result in 2 million of those jobs going unfilled”. One more industry, where skills gap is widening to a warning rate is nuclear industry. Retiring employees, lack of right training programs are two major contributing factors behind the growing skills gap in nuclear industry. 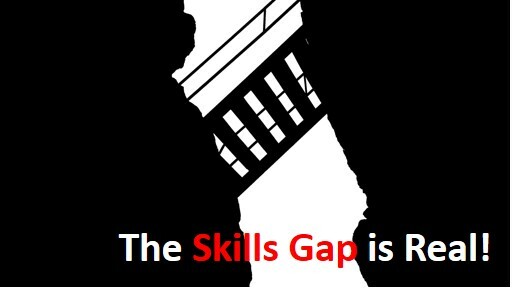 Another report from American Society for Training & Development indicates that 84 % of people think there is a skills gap in their organization, 6.4 % think there is no gap while 9.6% are unaware whether they have the skills gap or not. Organizations across industries are failing to bridge the gap and train their existing workforce while constantly focusing on finding new employees from outside. And, even when a new workforce is hired, it is critical to provide training and guidance, for them to be as productive as the previous workforce. Such situations can only be controlled if organizations take charge of their current workforce’s skills gap and find a medium to develop and engage them for their future needs. Let’s look at ways through which organizations can manage the skills gap crisis and create better sustainability for their business as well as workforce. Start Identifying the Required Skills: The Human Resources (HR) or the Talent Development team should identify the current and future needs of the organization and see how closely it matches to the skills set of their workforce. They can start determining the required skills in each area of the business by consulting the leadership team, taking insights from industry reports or by taking help from a consulting organization. It is important to keep organization’s vison, objectives and strategies in mind when you are doing a skills gap analysis. Start Building Skills Framework: Once you have identified the skills, it is important to see how they fit in to your company’s workforce structure. Are they needed on an individual level, job level, team level or at an organization level? Do two jobs have the same skills set requirements? The skills framework should promote balance development for employees by combining business, technical and leadership skills. A skills framework would help you to understand, assign and target right skills set for the right employees on a timely basis. Make a skills development plan: Once you have identified the required skills and its framework, the last and most important step is to develop skills development plan. See whether your current training program can incorporate skills based learning. Think about all the in-house resources you can use. For example, see if managers can plan a training program for their sub-ordinates based on their experience and knowledge. A learning management system, which enables skills centric learning can be very useful to plan, execute and track skills based learning. While skills gap is more dominant in manufacturing, technology, healthcare, energy industries, other industries and sectors of work are also witnessing this phenomenon. Organization across industries must gain a complete understanding of their skills supply, shortage, availability, which will enable them to make right workforce planning and learning & development measures. Skills gap crisis will soon become a threat to the economy, if organizations don’t foresee the situation and invest the right budget, technology, processes in to their training strategies and methods.